New Delhi, 17 July 2017: The Sub-Committee of Central Board of Trustees of Employees’ Provident Fund (EPF) on Contract Workers in its 5th meeting held on 18.01.2017 noted that the coverage of contract workers was 1.07 crore as compared to 1.02 crore on 07.11.2016. Establishments belonging to or under the control of the Central Government or a State Government and whose employees are entitled to the benefit of contributory provident fund or old age pension in accordance with any Scheme or rule framed by the Central Government or the State Government governing such benefits. Establishments set up under any Central, Provincial or State Act and whose employees are entitled to the benefits of contributory provident fund or old age pension in accordance with any scheme or rule framed under the Act governing such benefits. 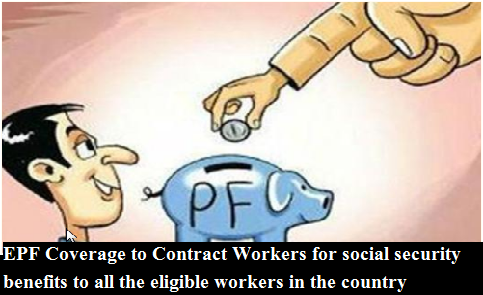 However, contract employees engaged in Government Departments/Organisations through contractors covered under the EPF and MP Act, 1952 are provided Social Security under the Act. In order to extend social security benefits to all the eligible workers in the country, Employees’ Enrolment Campaign, 2017 was conducted by EPFO during the period from 01.01.2017 to 30.06.2017.